Devising a concert is never anything like as easy as might be imagined, but this format seemed to result in a very satisfactory whole. Devising a suitable title for such a concert is, if anything, more difficult. I have come across a number of “clever” titles over the years, finding few which are totally satisfactory, nor are certain to successfully “pull” an audience. “Will and Art”? Well, did anyone ever address WS Gilbert as “Will”? If we are to believe Mike Leigh’s “Topsy-Turvy” Lucy Gilbert addressed him as “Willie”, but I doubt if anyone else tried to call him even “Will”. I am quite certain – quite – that no one ever addressed Arthur Sullivan as “Art”, or even considered “Art” as an abbreviation for “Arthur” in the late C19th. The narrative linkage ably supplied by Peter Joslin, with good support from Harvey Southorn and Ellie Williams, worked well, though it would, perhaps, have been a lot easier for Peter if he had relied on all his pictures being projected, thus being spared having to fumble for hard copies which were too small for any of the audience to see. Harvey and Ellie, supported by Laura Ransome, also gave us an excellent performance of Sullivan’s first published piece, “O, Israel!”. How good to witness what I assume was the first solo for ALGSS by the third generation of the Southorn family! It was a good idea to include a small number of really well-known G&S choruses. Wot, no “Hail, Poetry”? But, of course, the Utopian “Eagle High” was an excellent representative of the unaccompanied chorus. It was predictable and appropriate that “Utopia, Limited” and “The Grand Duke” should be well represented, and both selections showed that Sullivan, at least, was still in pretty good form in the last few years of the G&S partnership. For the former, Jenny Carr and Jan Taylor shone in the arch “Altho’ of native maids the cream” and Colin Walker and the Flowers of Progress effectively put across the highly “tongue in cheek” “Society has Quite Forsaken”. One hopes that the audiences were fully aware of the many “digs” at failings in English society – “We haven’t any slummeries in England”, “…poverty is obsolete and hunger is abolished. We are going to abolish it in England”, but especially “…Literary Merit meets with proper recognition – as Literary Merit does in England”, Gilbert being only too aware that Sullivan had been knighted in 1883 but he was still waiting…………and would do until 1907! And Brenda Southorn, of course, splendidly added Lady Sophy to her list of Gilbertian “female battleaxes” with “When but a Maid of Fifteen Year”. “The Grand Duke”, the final G&S opera, is certainly the poorest, especially thanks to an excessively convoluted plot and some writing which is decidedly below Gilbert’s best, but at least Sullivan could still produce some good music, as proved by the selection used in this concert, notably a spirited performance of “So ends my dream” by Jenny Carr and an equally impressive Roulette Song by Geoffrey Farrar. This song has an interesting background – sung by the Prince of Monte Carlo, who turns up very late in the opera, it was hardly performed in the few productions of “Grand Duke” until the concert version at the end of the D’Oyly Carte Centenary Season of 1975 (Centenary of “Trial By Jury”, that is), when it was sung by one of the stars of the latter years of D’Oyly Carte, the late John Ayldon. He very successfully reproduced the correct “style”, which Sullivan, an inveterate visitor to continental casinos, had written it in. It immediately became John’s “party piece” – there are, I think, two recordings available – and an important, expected part of any “Grand Duke” production these days. Geoffrey’s interpretation clearly confirmed just why. “Cox and Box” was the other major part of the evening, and what better cast could one look for than David Southorn as Cox, Philip Joslin as Box and Andy Taylor as Bouncer. All were greatly at ease with both words and music and the little piece came over very well indeed. I hope, though, that no one studied the synopsis in the programme too carefully, or they might have been a little confused, since it refers to an apparent death at sea of Penelope Ann, Cox and Box both trying to claim her inheritance and news that she has been found after all. These elements from the original story are usually omitted, as indeed they were this time, with a jump straight from Box’s description of his “suicide” to the arrival of Penelope Ann’s announcement that she is to marry Mr Knox. The ALGSS production of 1976 did include these extra details and, as I recall, they did extend the piece unnecessarily! The remainder of the programme included several songs from Sullivan’s last opera, “The Rose of Persia”, which, well done though they were, didn’t impress me greatly. But I did find them “lighter” than I expected. There was also an interesting piece from “The Foresters”, which I admit I had never heard of, and the rumbustious “Ho, Jolly Jenkin” from Sullivan’s one serious opera, “Ivanhoe”, another accomplished performance by Geoffrey Farrar. But, last but by far from least, there was “The Long Day Closes”. An inspired setting had the company spread round the perimeter of the Henderson Hall auditorium – the resulting sound was quite magnificent – ALGSS as you have never heard them before, and only served to confirm the quality of their singing. 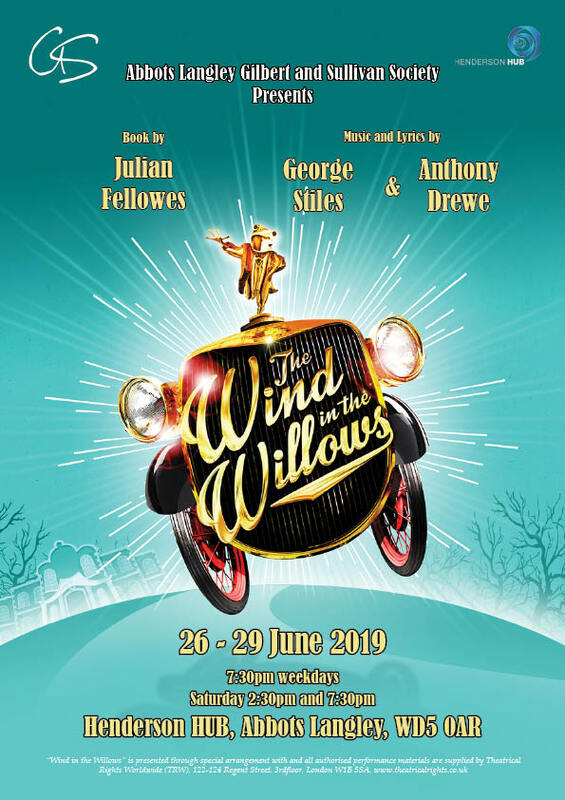 If I have failed to comment on the musical direction of Peter Jones and Karen Stocker’s piano accompaniment it is because both were impeccable throughout and were exactly the support the cast needed. Indeed, the same could be said of Emma Stratton’s direction. The confines of Henderson Hall make anything at all ambitious difficult and Emma sensibly didn’t try to be too clever! Lastly, I have commented on young Harvey Southorn’s debut. I should also commend the fine performance of one of ALGSS’s “veterans” – I hope she will excuse the term – Anne Rycroft, who applied her experience tellingly to Mabel’s “Go ye heroes” solo in the “When the foeman bares his steel” scene. Lovely to hear, Annie!